Assets America® provides aircraft financing, starting at $5 million, for corporate and commercial aircraft. Securing your aviation financing is our commitment. Assets America® personally crafts and closes deals on aviation new builds, purchases, and refinancing for high-value aircraft including jets, turboprops, helicopters and aircraft fleets. When you are considering financing an airplane, look no further than Assets America® for some of the most flexible airplane financing and jet loans in the US aircraft finance market. Businesses use and own corporate aircraft for their own purposes rather than commercial enterprises. Typically, corporate aircraft transport individuals connected to the business, including employees, directors, customers, vendors and others. Corporations may own or lease their own aircraft or may make arrangements with a third-party operator. Corporate jets are classified as very light (i.e. Eclipse 550, Cessna Citation M2), light (i.e. Learjet 31/40, Cessna CitationJet, Beechcraft Premier), midsize (i.e. Citation Excel, Learjet 45/60), super midsize (i.e. Gulfstream G200/G250, Challenger 300/350) large (i.e. Challenger 600, Falcon, Legacy) and long-range (i.e. Gulfstream IV/V/G650, Falcon 7X). Large jets typically carry up to 14 passengers with pricing starting above $30 million, whereas long-range jets carry up to 19 passengers and cost $60 million on average. We will be happy to arrange aviation financing for your next corporate aircraft of $5 million or greater. You’ll find our aircraft financing services superior to what you usually receive from other aircraft financing companies. Scheduled: These are the familiar carriers including: Delta, United, American and so forth. It also includes regional carriers such as Alaska Air. Scheduled passenger flights sell tickets to passengers, follow pre-established routes and schedules, and offer connecting flights to cover a network of destinations. Charter: Charters arrange flights on demand for customers. They fly smaller aircraft, although large chartered flights are available using large jets. Customers dictate destinations and schedules. VIP airliners are the largest charters. They accommodate large groups such as sports teams, press corps and entourages. Makers of VIP Airliners include Airbus, Boeing and Embraer. Freight: Large cargo carriers like Federal Express and UPS maintain their own fleets of aircraft for hauling freight. The aircraft have been specially fitted to maximize cargo volume consistent with the plane’s weight limits. Turn to Assets America® for commercial aircraft financing with some of the lowest aircraft financing rates from through our numerous aviation and aircraft financing sources including, but not limited to: commercial finance banks, private money funding, and numerous other sources. Assets America® provides aircraft financing from $5 million to $200 million, and much greater for aircraft fleet purchases. We bring aircraft financing and aircraft purchase expertise to companies looking for any type of jet loan, jet lease, or aircraft purchase. Here are the typical aircraft for which we provide aircraft loans and services. A turboprop is an airplane with a turbine engine that drives a propeller. Unlike a jet, the engines exhaust gases are insufficient to create enough thrust since the energy is used to turn the propeller. A compressor forces air and fuel into a combustor where it ignites, and generates power that drives the propeller and the compressor. Additional thrust is derived from a propelling nozzle that exhausts gases to the outside. The most popular single engine turboprop is the Pilatus PC-12, whereas the leading multi-engine turboprop is the King Air 200. A jet aircraft has one or more turbofan engines, which are air-breathing jet engines that use a gas turbine to feed mechanical energy into a fan that provides thrust. Only some of the intake air travels through the turbine, with the remainder routed directly to the fan. The Learjet 70 and 75 are light jets manufactured by Bombardier, a Canadian aircraft maker. Learjets have powerful, fuel efficient engines, winglets and advanced avionics. They hold a crew of 2 to 8 passengers, with a maximum takeoff weight of 21,500 lbs and a cruising speed of 535 mph. The Learjet 70 and 75 cost more than $10M each. Gulfstream, a division of General Dynamics, makes a lineup of jets that include the G280, G350, G450, G500, G550, G600, G650 and their top of the line G650ER. All can hold up to 19 passengers except for the 10-passenger G280. The Gulfstream G650 (see image below) is the company’s largest and fastest business jet with a cruise speed of 610 mph, a maximum takeoff weight of 99,600 lbs. and a price of almost $70 million. The 650ER is an extended range version with an additional 4,000 lbs. of takeoff weight. This Canadian aircraft manufacturer makes several business and commercial jets. The largest business jet is the Bombardier Global Express, and commercial jets produced include the Bombardier CRJ series and the Airbus A220 series. The CRJ1000 sells for around $50 million. This is a French manufacturer of the Falcon family of business jets. Its most impressive jets are the Falcon 7X and 8X large cabin tri-jets. Top travel range is 7,400 miles, and individual jet prices are north of $50 million. The Boeing Commercial Airplanes Division makes business jets and airliners. The BBJ family of narrow-body business jets are derived from the Boeing 737 airliner. Wide-body VIP models are based on the commercial 747, 777 and 787 airliners. Boeing also makes the 767 model. The Boeing 787-10 Dreamliner aircraft sells for about $326 million (see image below). This is a European manufacturer of the A-Series of commercial airliners. The top model is the Airbus A380 (see image below), a huge widebody, double-decker with four jets that is currently the world’s largest passenger airliner! You can own one for a cool $445.6 million, and we can arrange both the aircraft sale and financing for you. A helicopter is a rotorcraft that can take-off and land vertically, fly in all directions and hover. There are many variations on the design of the rotors, cabins and engines. American helicopter manufacturers include Boeing, Textron (Bell), Lockheed Martin (Sikorsky), MD and Kaman. 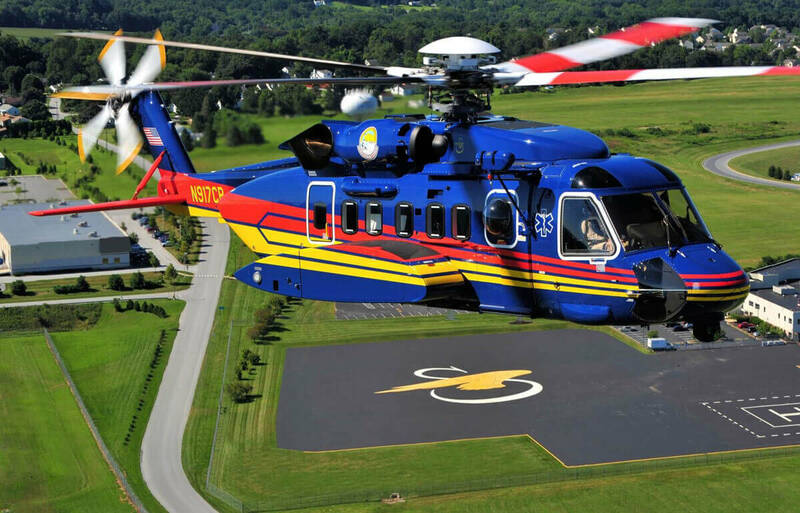 A typical executive helicopter is the Lockheed Martin Sikorsky S-76D (see picture below) powered by a pair of Pratt & Whitney engines, good for a 11,700 gross weight and top speed of 178 mph. It seats 13 and prices start around $10 million. Wet leasing: The lessor (for example, an airline) provides aircraft, crew, maintenance and insurance to the lessee (another airline or other business) that acts as an air travel broker. Dry leasing: The lessor is an aircraft financing company that provides an aircraft without the crew and other features of a wet lease. Lessors are usually banks and leasing companies. Typical term is two years and is often used between a major and a regional airline. Both capital and operating leases are available. A capital lease usually ends with ownership transfer to the lessee, whereas the airplane reverts to the lessor under an operating lease unless the lessee chooses to renew the lease or purchase the aircraft. The 2018 Current Aircraft Finance Market Outlook from Boeing forecasts another year of stable growth and funding diversification. The Global Market Forecast 2018-2037 from Airbus predicts long-term growth as we continue to increasingly take to the skies. Reuters has also published a well-curated report on the aircraft leasing market from 2018-2023, which estimates the worth of the market to reach $62,221.8 million. For more information, check out this article 20 Tips for Buying an Airplane from Plane & Pilot Magazine. We invite you to contact Assets America® for the best deals in aircraft financing. Assets America® leverages a large nationwide network of aviation lenders to provide you rates as low as 170-200 basis points over the 30-day LIBOR for up to 100% of the aircraft’s value. We can also provide operating and capital leases that may be customized to perfectly fit your needs. Call us today at (206) 622-3000!